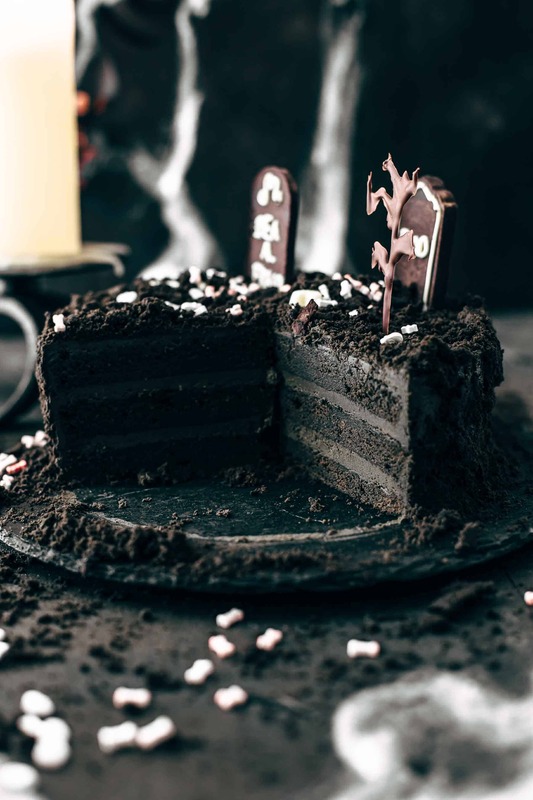 With this Death-By-Chocolate Halloween Cake is a perfect Halloween night and chocolate indulgence guaranteed! Dark chocolate cake layers frosted with dark chocolate buttercream. Oh, I can’t tell how much I love Halloween. I’ve been waiting for it since months. Yes, I’m that crazy that I’m excitingly looking forward to Halloween with 105°F outside. Have you ever been in the Universal Studios at Halloween? As soon as I live in California, I will go to the Halloween maze EVERY SINGLE YEAR. I love watching the videos of the different Halloween mazes on Youtube. In the US, Halloween is much more exciting as it is here. It slowly starts getting a thing here in Europe, but it’s not really a hype. Bummer! Are you a Halloween fan? 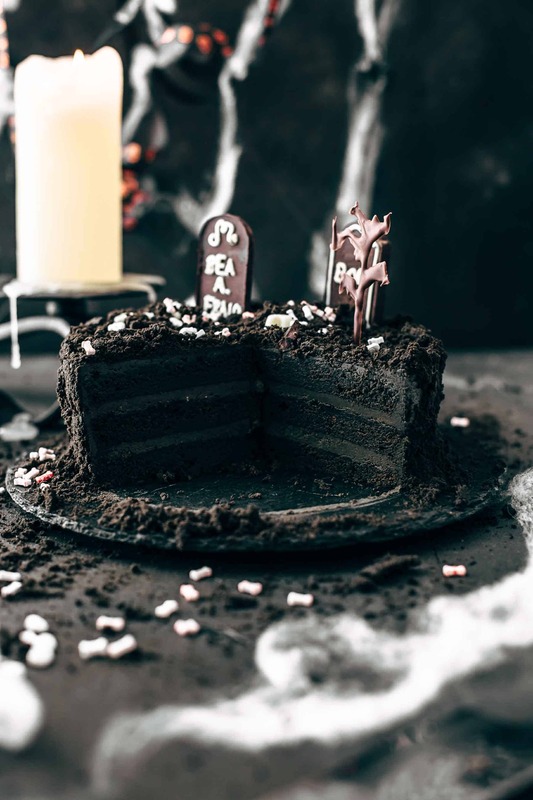 You will be with this spooky Death-By-Chocolate Halloween Cake. Isn’t this a showstopper? I’m sure this cake turns your Halloween night into a huge hit. It’s a three-layered dark chocolate cake frosted with dark chocolate buttercream. And the crumbles on the outside? We come soon to this point. I was thinking about to make a pinata cake out of it. You know, cutting out a circle of the middle layer and fill it with Halloween candy. But this could be a project for next Halloween. A Halloween Pinata or Trick or Treat Cake. Recently, I made a Triple Chocolate Ombré Cake and this is was the best chocolate cake I’ve ever had. The texture and the flavor were on the point. So I took this recipe as a starting point and did three dark chocolate layers instead of white, milk, and dark chocolate layers. And I replaced a part of the flour with cocoa powder to deepen the flavor and the color. 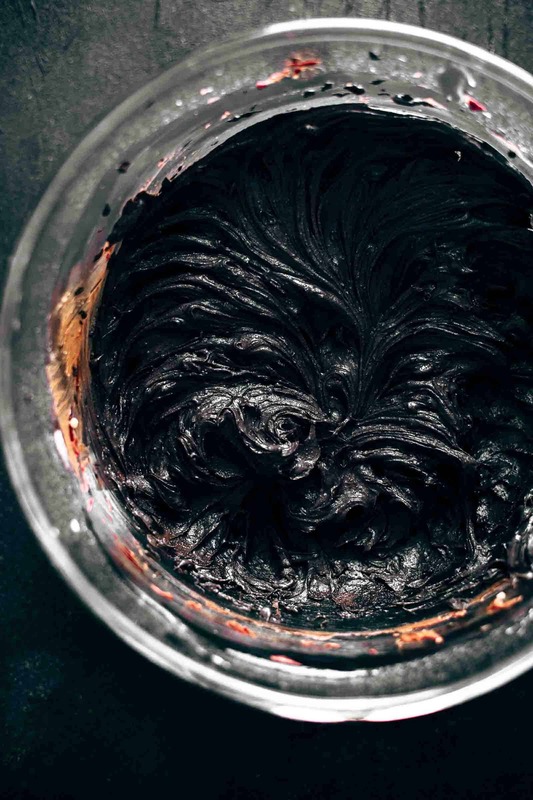 For this deep black color, you need to add some black food coloring. But because the cake is very dark on its own, you don’t need that much of it. You need to take a dutch-processed cocoa powder for this cake. It makes the cake even darker than natural cocoa powder would do. But that’s not the only reason. Because there is baking powder and no baking soda in the cake you need to go with dutch-processed cocoa that the batter rises during baking. The batter will be very thick. So make sure that you spread it evenly into the pan that it has a flat surface. The texture of the baked cake is wonderful. Rich, dense, and moist. It’s not an overly sweet cake and comes with a strong dark chocolate taste. The buttercream is made of butter, powdered sugar, semi-sweet chocolate, and salt. Oh and not to forget. There is also black food coloring in the frosting. Did you see the two photos of the bowls? That’s not the same picture. The first picture is the cake batter and the second is the buttercream. They look almost the same, right? It’s super creamy and ultra chocolatey. And it’s also not overly sweet. The fun part: cake assembling and decoration. That’s now the best part! The decoration of the cake is super fun. To create a super authentic and spooky graveyard look, we need something that looks like earth, right? How do we get this? Correct! With crumbled chocolate cake. Hold on before you smash your cake layers. We get enough cake crumbles by cutting off the tops of the cake before frosting. We need to do this any way to create a flat surface on each cake layer that the cake is straight and even. So cut off the tops of each cake layer and set aside. Let stand uncovered at room temperature that it loses a bit of moisture. It’s easier to get fine crumbs when the cake is a bit dryer. Assemble the cake and chill. While the cake chills, prepare the decoration. I bought Wilton Tombstone Candy Molds and filled them with melted semi-sweet chocolate. After filling place them for about 15 minutes in the freezer. I recommend to put a drop of oil into the molds and wipe them out with kitchen paper. This makes it even easier to remove the chocolate tombstones from the molds after freezing. 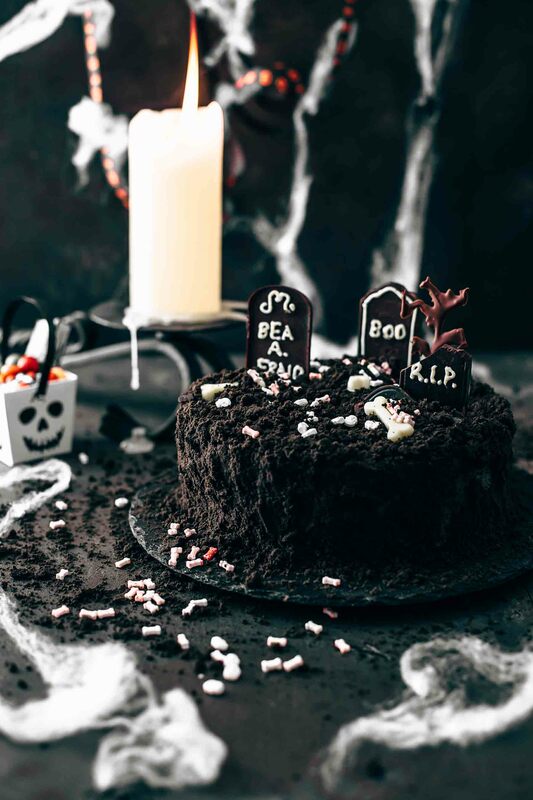 Remove them by inverting the molds on a wax paper and lightly knock with the fingers on the molds that the chocolate tombstones fall out. Let chill for about 30 minutes. 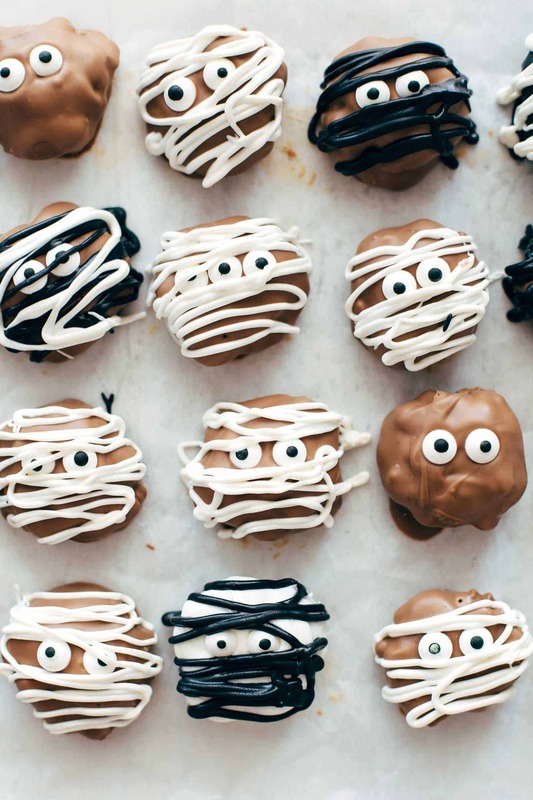 Then write spooky words on your tombstone with white chocolate or icing (using a Candy Melts Piping Tip Set for example. ), or use a candy decorating pen. BEA.A.FRAID is the one I love the most! I also did a chocolate tree. Therefore, I drew melted chocolate on a wax paper with the tip of a spoon. I know there would be better methods doing this, but I didn’t want to have very accurate trees. I wanted them to look a bit strange and weird to create an even spookier look. Let dry at room temperature. You can prepare the tombstones and the trees the day before decorating. I also did it the day before that the chocolate looks kind of aged. You know when chocolate gets warm and then cold again the oil comes out and creates a spotted and washed out look. This made the tombstones look old and weathered. The decoration of the candy is up to you! Do whatever you like the most. You could also color the tombstones with food coloring which is suitable for chocolate. If you want to make them grey for example, you may want to use white chocolate or candy melts and color them. Remove the cake from the fridge and let stand for about 30 minutes that the buttercream softens lightly. Then crumble the cake tops with your fingers into fine crumbs. Sprinkle crumbs on top of the cake to cover it completely. Press the rest of the crumbs with your fingers against the sides carefully. The cake should be covered on the top and around the sides completely. Reserve a few crumbs. 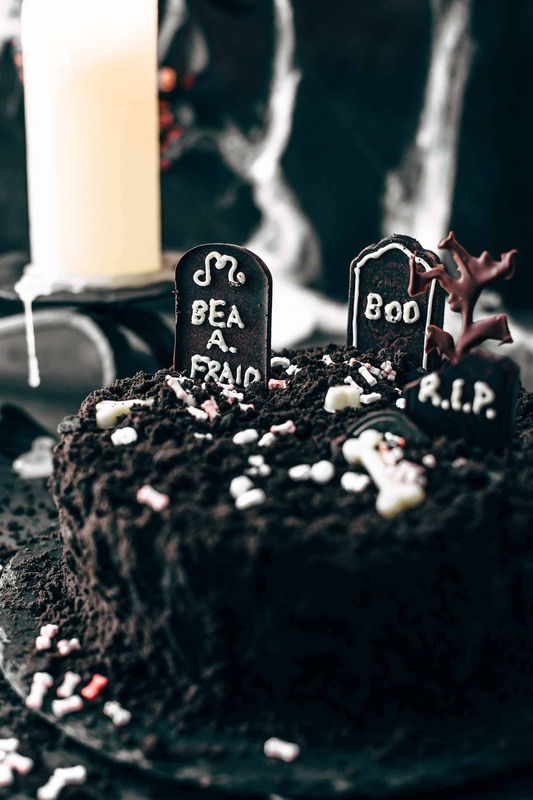 Place your decoration on top of the cake and sprinkle a few bones and skulls sprinkles in front of the tombstones. Sprinkle the remaining cake crumbs on top. The cake is best eaten at room temperature. Best for your Halloween night! 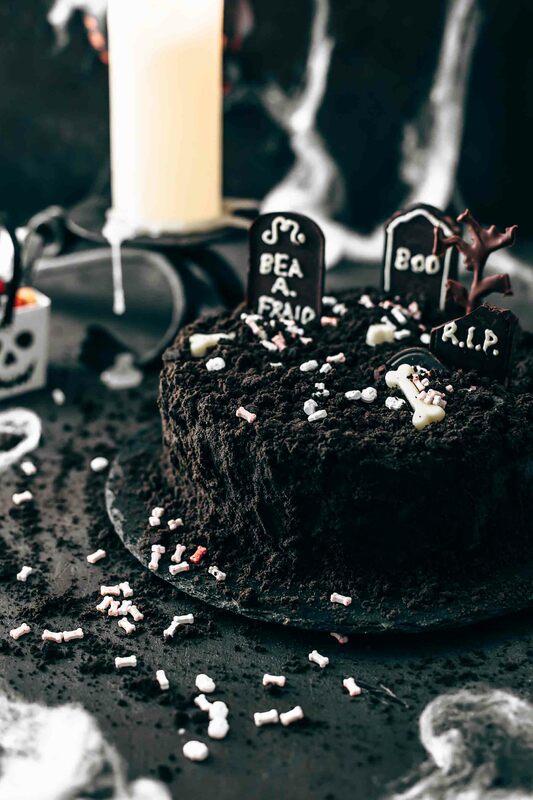 If you make this Death-By-Chocolate Halloween Cake recipe leave a comment, rate it and tag a photo #alsothecrumbsplease on Instagram! Would love to see your snap! 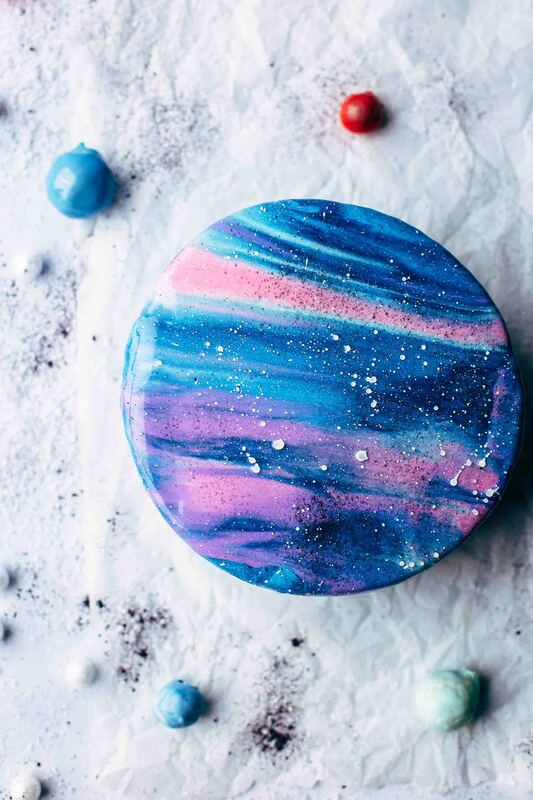 You may also like Mirror Glaze Galaxy Cake Recipe, How to make a Rainbow Cake, Homemade Take 5 Halloween Mummies, Chocolate Coffee Cake Recipe, or click here to see all recipes. In a medium bowl combine flour, cocoa, baking powder, and salt and stir to combine. Set aside. 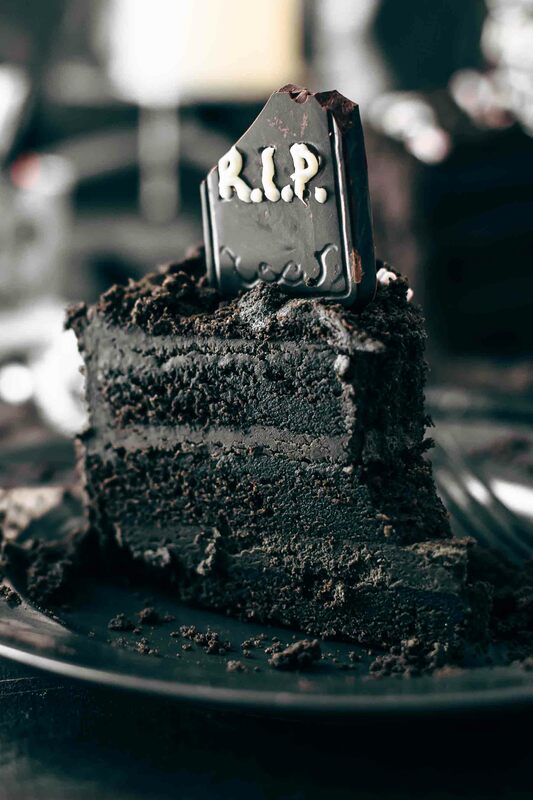 Make the death-by-chocolate cake layers: In a large mixing bowl with a stand or handheld mixer fitted with a whisk or paddle attachment, beat butter, oil, and sugar until creamy for about 2-3 minutes. Add eggs and vanilla* and mix until fully incorporated. Alternately add dry ingredients and buttermilk, beginning and ending with dry ingredients. Stir just until combined. Add chocolate and stir just to combine. Add food coloring (amount depending on which food coloring you take – read instructions on the label) and stir to combine. The batter should be black. The batter will be very thick. Transfer to the prepared baking pans equally and spread evenly. Bake for 18-22 minutes or until a toothpick in the center comes out clean. Don't overbake or the cake will be dry. Let cool to room temperature. 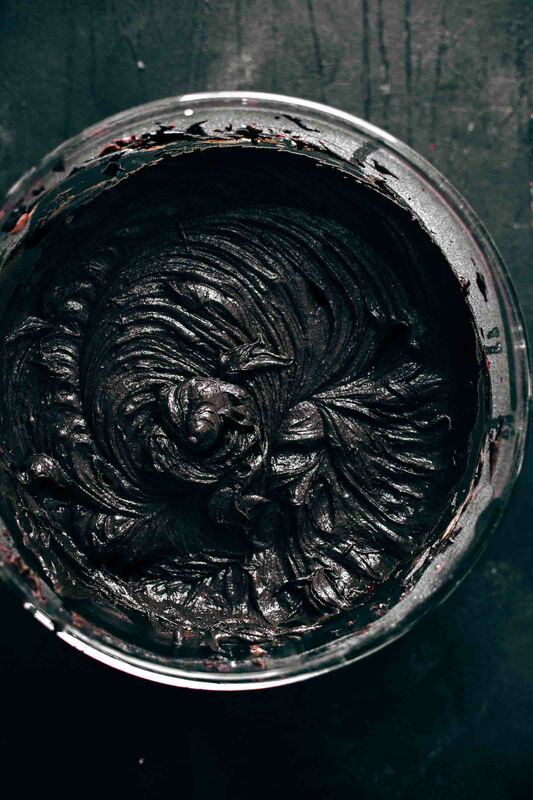 Make the death-by-chocolate buttercream: Beat butter on medium-high speed until soft and creamy, about 2-3 minutes. Add powdered sugar and beat on medium-low speed until fully combined and smooth. Add chocolate and stir until creamy. Add food coloring and stir to combine. The buttercream should be black. Assemble the cake: Cut a layer off the tops of your cakes to create a flat surface. Transfer cut tops to a plate. Place uncovered on your kitchen counter. 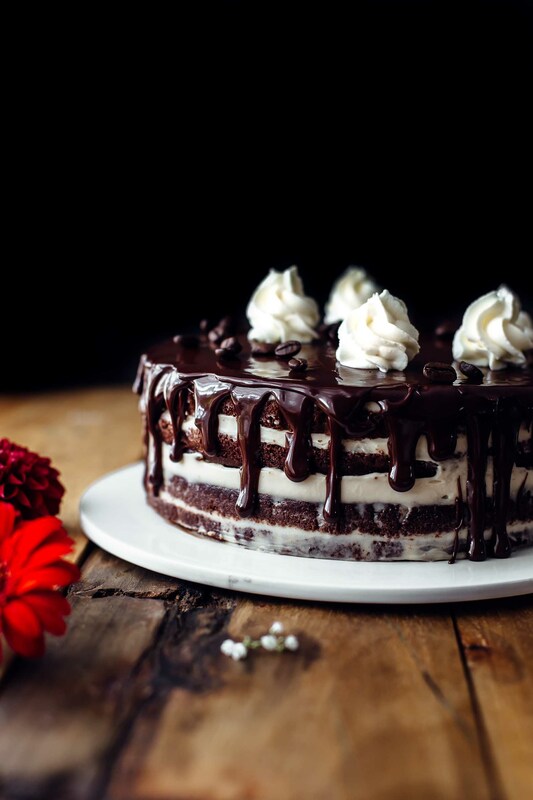 Place the first chocolate cake layer on a cake stand, turner, or serving plate. Spread about 1/4-1/3 of the chocolate buttercream evenly on top of the cake. Repeat with the other two chocolate layers. Frost the outside and the sides of the cake with the remaining frosting. Level the top and the sides with an offset spatula. Chill 3 hours in the fridge. While the cake is chilling, prepare the decoration. 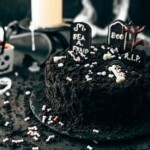 Read blog post above to read what I did and which tools and products I used to make the chocolate tombstones and the tree. The decoration is up to your preference. You can also prepare the decoration the day before. 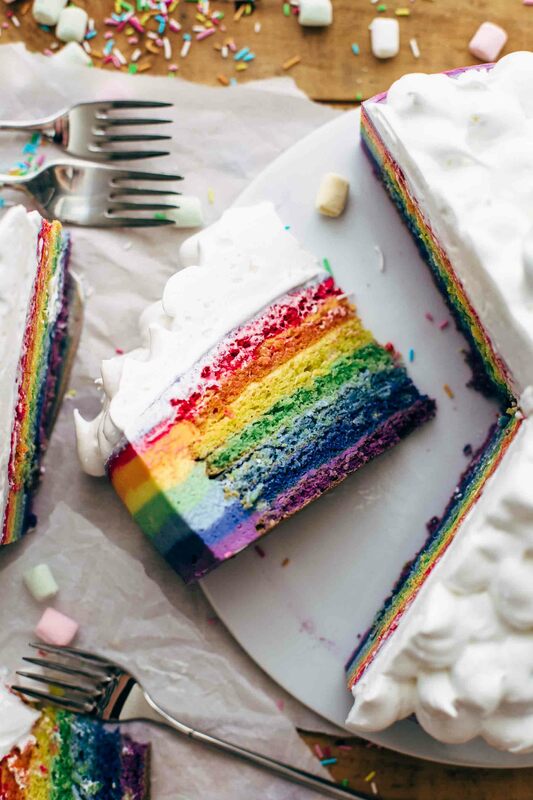 Decorate the cake: Remove the cake from the fridge and let stand at room temperature for about 30 minutes that the buttercream lightly softens. Then crumble the cake tops with your fingers into fine crumbs. Sprinkle crumbs on top of the cake to cover it completely. Press the rest of the crumbs with your fingers against the sides. The cake should be covered on the top and around the sides completely. Reserve a few crumbs. 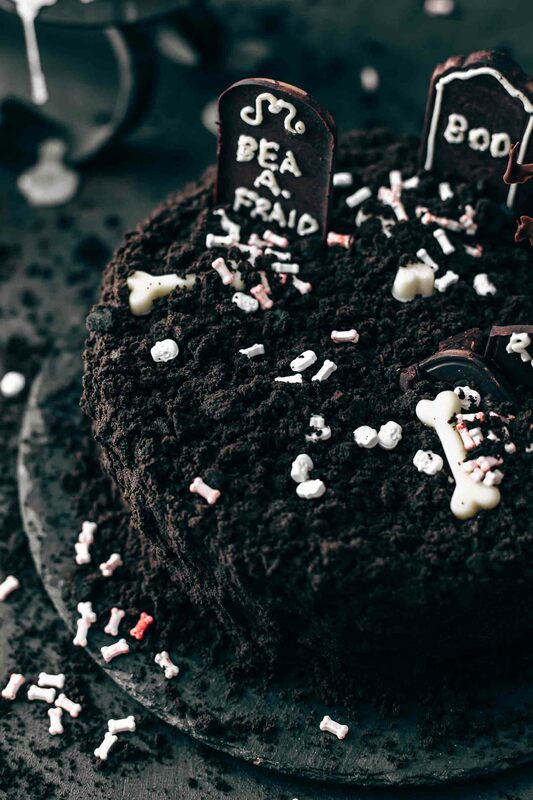 Place your decoration on top of the cake and sprinkle a few bones and skulls sprinkles in front of the tombstones. Sprinkle the remaining cake crumbs on top.